(Bloomberg) -- Rahul Gandhi, president of India’s main opposition Congress party, said his party will exempt new businesses from seeking permission and ease bank credit if it is voted to power. The Congress will also scrap “angel tax,” a term used for the levy on fundraising by startups, Gandhi said on Twitter. The party will also give incentives and tax credits to new businesses based on their ability to create jobs, he said. These incentives will be part of the Congress party’s manifesto, which has also promised income support of 72,000 rupees ($1,046) annually to poor families. Startups will just need to register their companies and will not need any other approval to begin operations. They have a three-year window to get all the permissions. Congress party is seeking to wrest power from Prime Minister Narendra Modi’s ruling coalition in the elections that will take place in seven phases between April 11 and May 19, with results to be announced on May 23. Modi has been criticized by the opposition for not fulfilling his promise of creating 10 million jobs each year -- a pledge that helped him win over India’s youth in the 2014 election. In the absence of timely and credible data, it’s difficult to estimate the number of jobs created during Modi’s term. 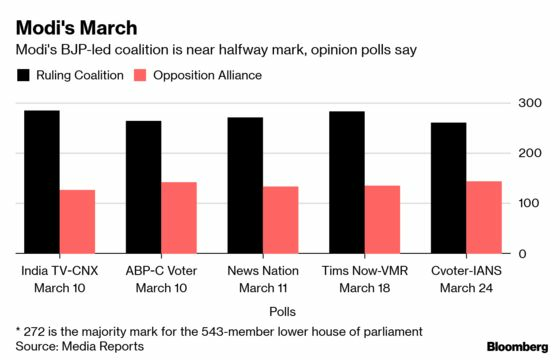 Outcomes in eastern and north eastern region of India will have a significant bearing on post-poll government formation, Amit Khurana, head of equities at Dolat Capital Market, said in a March 26 report. "During the past five years, Modi has made several promises to the people of this country,” said Gandhi in an election rally in Haryana. “Wherever he goes, he spreads hatred"
Congress’ income support plan may be fiscally prudent is it offsets existing subsidies, which amount to about 3.2 percent of GDP, said Sonal Varma and Aurodeep Nandi, economists at Nomura in a note on March 26.